It's been ages since I swapped over my general purpose table saw blade. It comes out to fit other specialist blades quite often but back it goes without much thought. Normally my saw is set up such that I rarely need to do any planing and a light sand and wood is ready for finish but just lately I noticed a few saw marks and gave the blade a good check over. Poor thing has shed a tooth and so I fitted my ready ground spare and the difference was incredible. So much quieter and lovely finish again. I gave my saw doctor a ring and £3 to fit a new tooth and £8 to give it an all over grind (34 tooth). £11 plus vat to return it to full health and ready for service again. Moral of the story? Well worth giving your blades a quick once over every now and then. I guess it is bit like spongy brakes. One doesn't know quite how bad they are until they are adjusted. The noise from my TS got so bad a few years back that I thought the bearings had gone. A bit of TLC and a new blade and it was whisper quite again. Years ago, I propped an 8x4 against a low wall and took a longitudinal cut along it. Thought I'd made sure the cut cleared the end of the wall...did it hell!! Lost three out of 25 rip teeth...and about a quarter of a brick...shrapnel was something else. "Doh" does NOT begin to cover it. When I was fitting my trunking I cut the wood to the required length and drilled the screw holes putting the pocket screws in as I went. I finished for the day and having thought about it over night I decided to cut the timber in half. I clamped the wood down and started cutting. I have a good habit of wearing safety boots and work trousers feeling something hit my leg I eventually stopped when I saw a spark. This could have been a serious mistake as you can see I removed all of the teeth from this blade I am very new to these machines but I have learnt an important lesson an I will check every piece of wood I cut in future new or old. I am going to keep this blade and put it on my workshop wall above my band saw to remind me. 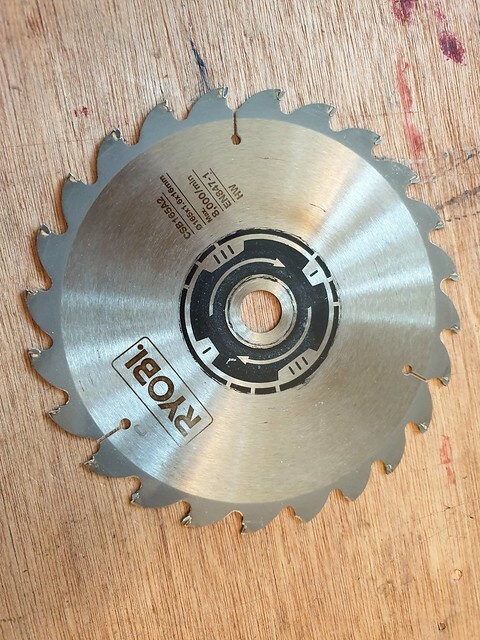 It is not uncommon to see sawblades made into clock faces for workshop clocks. Your 24 tooth wreck lends itself nicely to being divided into 12 hours. Battery clock movements are cheap as chips and for only a little more can be radio ones to keep perfect time. 9fingers wrote: It is not uncommon to see sawblades made into clock faces for workshop clocks. Thanks Bob what a great idea many leather workers use them to make knives but I like the clock idea.